Overlooking signals from your pup that something is wrong in their world is a common and dangerous mistake that many dog owners make. You get too busy to pay attention, they are annoying you, or you simply don’t know how to understand them. They will always try to tell you when something is wrong. It’s important to take the time to listen to them. If you don’t then things can go wrong in a hurry. It could wind up taking a big bite out of your pocketbook, send you off chasing your tail on expensive guesswork, and your dog could wind up losing their health, well-being or even their life. If your dog begins behaving in ways that aren’t appropriate, are unusual, puzzling or odd, stop. Take a minute to consider things from their viewpoint. To know for sure what’s going on, you need to ask them so they can tell you how they feel, if they hurt, what they are confused or worried about. Your dog doesn’t deliberately do things just to make you sad, angry or upset. They do what they do as a way to express themselves the best way they know how from their unique viewpoint. Your pet is always trying to communicate with you. Your job is to listen to them so that you can learn about their experiences and discomforts and then take appropriate action on their behalf. Hiding, running away, escaping, unexplained aggression, growling or biting, not wanting to be touched in certain areas on their body are all indicators something is very wrong in their world. 1) Don’t touch me! If your dog shies away from your touch, then consider why. If they don’t let you touch them on the top of their head, that could indicate a dominance issue (whose above who in the hierarchy or status quo) or it could mean they are in pain. They may have a headache, sinus problems or a toothache, or they may be having trouble seeing. They could also be experiencing another kind of undiagnosed medical problem. If they don’t want you to touch their hips or back, often that is because their hips or back hurts. They could be afraid of your doing something that might hurt, or again, they could be having a vision problem making it hard for them to tell what is going on around their body. 2) I won’t eat that! Not eating, being ﬁnicky or picky with their food is a classic sign that something’s wrong. A healthy animal enjoys eating and will happily gobble up what’s put before them. However, if the food is actually not good for them and is making them feel sick, they will refuse it. If they are having trouble eating due to a tooth or gum problem, or if the food doesn’t smell or taste right, they will just say no. Your job is to find out why the food doesn’t agree with them, and find what does appeal. Many animals have refused tainted food that could have made them very sick, even when their caretakers had no idea it was bad. But if your pet has no choice but to eat it or starve, their natural instincts are overridden and trouble ensues. 3) I’m scared! If your dog is afraid, your ﬁrst response should always be to determine what is causing them to be fearful. If there is truly something serious to be afraid of, something (or someone) is hurting them, scaring them or there is hidden abuse from somewhere, then it’s your job to safeguard and take them out of harm’s way. If their fear response is to something that is no longer reasonable, then you need to take action to help them deal with and overcome their fear. Never allow your dog to live in fear. It is a terrible thing to be ruled by fear. It is not compassionate, loving or kind to ignore this serious problem. Fear can be undone. Don’t coddle or comfort them when they are afraid. That just tells them that they’re right to be afraid! Comforting a frightened dog tells them that you actually want them to be afraid because you’re rewarding them for that behavior. Doggies love attention and reward, so they will figure out that you want more of that behavior, and will be happy to give it to you! After determining for yourself that there truly is nothing obvious to be afraid of, then take action to improve their self-conﬁdence and self-esteem. Teach them how to behave, what to expect, what’s required of them and reward them for the behavior you really do want. Take some time to consider things from their viewpoint. Ask them questions so you can understand what’s really going wrong for them. Only they truly know what their truth is, where the problem is really coming from, and what they need. 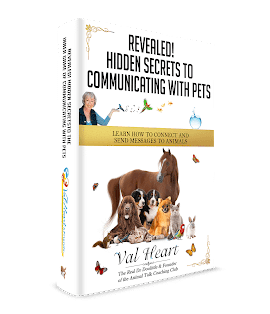 To do that successfully, you may need to engage the help of a pet communicator or learn how to talk to animals yourself. Catching problems in time to be proactive will make all the difference in your ability to resolve whatever it is as quickly and easily as possible. The Psychic Abilities of Animals: Do they have a sixth sense after all?